Authority was then given to Lieutenant General John L. Dewitt who lied to the public and reported that Japanese-Americans were involved in sabotage and espionage despite having no evidence to back these claims. Sound familiar? 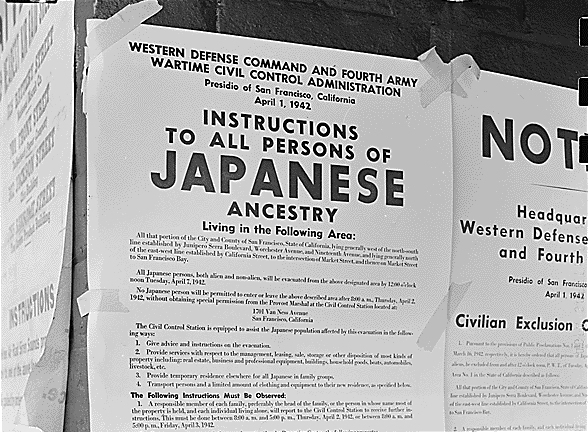 "All Japanese persons, both alien and non-alien, will be evacuated from the above area (San Francisco) by 1:00 o'clock noon, Tuesday April 7, 1942"
Attorney General Francis Biddle and many in the Justice Department, on the backing of the actual intelligence gathered and the principles of the U.S. Constitution, strongly opposed the evacuation and imprisonment of American citizens, regardless of their ancestry. However the western United States (encompassing California, Washington. Oregon, Montana, Idaho, Nevada, Utah, Arizona and the then Territory of Alaska) was declared to be under the authority of the military’s Western Defense Command. “War Relocation Camps” were prisons created to incarcerate thousands of Japanese Americans until Order 9066 was rescinded two years later in 1944 and the last of the camps closed after four years in 1946. The attacks on Pearl Harbor certainly could not be condoned, but neither could our shameful response to imprison innocent American citizens out of fear. While self-preservation dynamics have played on repeat in U.S. foreign and domestic policy over the last century often resulting in tragic consequences, my intent here is not to dwell on our national sin. Instead, this history lesson is an occasion to look at the man in the mirror. What is it about fear that so often trumps my own sound judgment? Perhaps more importantly, am I to be held responsible for my actions in response to being wronged? In 2005, some dear friends and mentors in Montana invited Jaime and I to participate in a marriage class using Dr. Emerson Eggerichs’ “Love and Respect” curriculum. To this day I have not seen a better exegesis of the practicalities of the Biblical definition of marriage. One of Emerson’s phrases that stuck in my head is “Our response is our responsibility.” In speaking of his wife, Emerson says “Sarah doesn’t cause me to be the way I am. She reveals the way I am.” He expounds by noting that a grain of sand in a human eye may ultimately lead to infection and loss of vision, while the same grain of sand in an oyster can lead to secretion and then a pearl. Eggerichs points out that the speck of sand in both instances is only an irritant that “reveals the inner properties” of both the eye and the oyster. Adversity cannot force us to behave in a certain way, it can only test and then reveal who we already are in that moment. To further illustrate the point, Eggerichs notes that a rose crushed underfoot reveals a pleasant aroma, whereas pressure applied to a skunk yields a much different result. When times get tough, are you a rose or a skunk? Too often, when the inner properties of my personality and soul are revealed under pressure, no one is mistaking me for a fragrant flower. In three days, Ash Wednesday will usher in the season of Lent and offer a period of reflection and repentance. Forty days of intentionally preparing for Christ’s death and resurrection. In both small and large opportunities created by adversity, I wish to be a pleasing aroma to the Lord. I’m looking forward to the opportunity to dedicate the upcoming 40 days to welcoming difficulties and making my enemies my teachers. The best stories are unpredictable. It was the evening of December 8, 2011 and I was in a risk-taking mood. Just a week and a half earlier, on the morning of November 27, 2011, while teaching an adult Bible class, I invited my Church family to assist with serving the orphans of our society. I told them of my social work case load of 16 youth ranging in age from 15 to 21, all removed from their homes and biological families. Young people who never exited the State’s system of foster care through reunification with their families or by adoption to new families. As thirteen of my 16 youth were over 18 years old at the time, there weren’t too many people lining up to help with providing Christmas gifts, instead preferring to donate to the cause of younger children in foster care. As Thanksgiving had just passed and Christmas would rapidly be approaching, I mentioned that if I could raise enough money, say $400, I could purchase each of my kids at least a $25 gift card. Not enough to make a significant purchase, but enough perhaps to let them know that someone cares about them and that they are not alone. The brothers and sisters at the Ward Street church of Christ immediately responded to this call and two weeks to the day of my request had already donated over $1,000 toward gifts for my teens. Folks were willing to give more and made sure I knew they were ready to give whatever was needed. People were so eager to help, I had to make an announcement to stop having funds donated. I would have a hard enough time wisely spending the money that had already come in. But there was one young man, whose case had recently been assigned to me, for whom I wanted to do something a little more extravagant. 17 years old, he had a decision to make prior to his 18th birthday in early January of whether to continue receiving services from the State and remain in his foster home, or to forego any further relationship with the bureaucracy and take his chances on the streets. He is the type of kid you can’t help but like due to his authenticity. For example, he informed me he was having a hard time making a decision about what to do at 18 as he feels he can only plan one day at a time and did not simply want to sign paperwork indicating an agreement he was not prepared to keep. In looking for ways to build a relationship with this young man we came to talking about his favorite sport, basketball, and lamented the NBA lockout which was threatening the cancellation of the entire season. I asked him what team he followed and he confidently stated he was a Lakers fan, a rarity here in the Celtics’ backyard, and that his favorite player was Kobe Bryant. I chuckled in surprise and told him that I have been a life-long Lakers fan and that my favorite current player is Derek Fisher, who was acquired by the Lakers in the first round of the 1996 NBA draft along with Kobe. I asked him if he had ever been to a game and he laughed as he said no. I admitted I had never been to a game either, even though I lived in L.A. for a couple years, and teased that maybe we should go together some time. Now here I was, sitting in front of my laptop on this early December evening, looking at tickets on StubHub for a prime-time Lakers-Knicks matchup at Madison Square Garden slated for February. The NBA lockout had finally ended and I was thinking, “Why not?” One answer was the insane ticket price of $175 a seat, close to an even $200 after fees. But I figured with All-Star point guard Chris Paul looking for a trade to the Knicks to form their own three-headed monster of CP3, Melo and Amare, and the Lakers coming to town I couldn’t really expect tickets to be less expensive in an arena that seats only 19,763. I informed Jaime I was thinking of buying two tickets, one for my foster youth with donated funds and that my seat would be financed in large part by gift subsidies from my mother who normally sends $150 my way between Christmas and my own early January birthday. I theorized this could be a once in a lifetime opportunity for both myself and my client and my supportive and amazing wife mirrored my excitement encouraging me to purchase the tickets. But in the days leading up to the game, the Paul trade to the Lakers was vetoed by the league, the Lakers would find the condensed scheduling of a lockout-shortened season especially tough on their veteran legs leading to a woeful road record, Knicks superstar Carmelo Anthony was injured and it was announced fellow New York All-Star Amare Stoudemire would not be playing in the game after the tragic loss of his brother in a car accident. However, good spirits prevailed as we would still be able to see Kobe and D-Fish. Plus, with all of the Knicks’ firepower disabled, it appeared a lock we would see a L.A. win in our first NBA game. 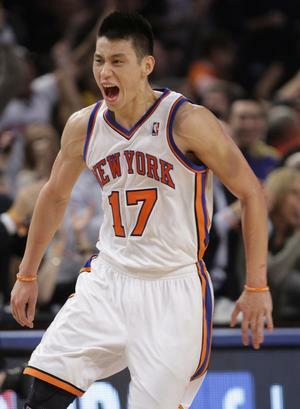 I didn’t know who Jeremy Lin was until the night before the event. I was discussing the upcoming game and the opportunity it was going to build a stronger relationship with my client, when a co-worker mentioned the Knicks had some undrafted guard who went to Harvard and had been buried deep on their bench who had apparently found his way into the starting lineup and led the Knicks to a three game “Lin-ning” streak. New Yorkers and their losing team were finding love in a hopeless place as the California-born Lin, whose parents are from Taiwan, became the first Asian-American player to start an NBA game and lit up the Nets, Jazz and Wizards in a five day span averaging over 20 points a game. With the help of the New York City hype machine, suddenly Friday night’s matchup against the Lakers was again being billed as a marquee show, only this time due to a player who wasn’t even on the Knicks roster on Christmas day and was reportedly sleeping on his teammate’s couch. The drive down to Manhattan provided ample time to hear my client’s own story from his perspective and our night was off to a good start as we walked through a lit up Times Square on Friday evening en route to the game. It appeared we were in good company as we approached “The World’s Most Famous Arena” with many fans dressed in Los Angeles Purple and Gold. There were also scattered Blue #17 jerseys fresh off the press that had already begun to circulate especially among the Asian-American fans in attendance. The souvenir stand on the lower concourse sold out of Lin jerseys before the game even started. The sold out crowd was buzzing prior to the opening tip as we all looked forward to finding out if “Lin-sanity” could be sustained through a visit from Bryant, the league’s leading scorer, or if the novelty act was up. I was confident of the latter and leaned over to ask my client, ‘How much do you think we’ll win by?” He smiled as he shrugged his shoulders and declined to give his pick. It did not take long to realize the young man had been wise in not counting Lin or the Knicks out. A couple minutes into the game, Lin knocked down a three from the corner over 7”1’ Center Andrew Bynum putting the Knicks up 3-2, and he didn’t look back. Lin set up Tyson Chandler for a bucket that put the Knicks up 5-4. They would not trail again. A jumper, a second assist to Chandler, another jumper, followed by a Lin steal and layup forced a Lakers timeout five minutes in with the score 13-4. Jeremy Lin was outscoring the Lakers himself by five points. My client and I looked at each other shaking our heads in disbelief and remarking that the Lakers looked tired after last night’s overtime win in Boston. The electric New York crowd became more energized with each Lin basket and assist as the Garden’s Jumbotron incited cheers of Je-Re-My! Je-Re-My! Nearing the end of the first half, Lin blew past Derek Fisher on a fast break spin move and his following acrobatic lay-in gave him 18 points, gave his team a 9 point lead and won the hearts of all frustrated Knicks fans for life. The Knicks have this elaborate alumni program and kept announcing “Once a Knick, Always a Knick!” before announcing the attendance of Larry Johnson, Anthony Mason, John Starks and Walt Frazier at various points throughout the game. I found myself thinking that even if Jeremy Lin’s overnight sensation story doesn’t last another week, he already had earned himself an alumni pass based on the crowd’s admiration. There wasn’t much to be pleased about as a Lakers fan as Kobe started the game 1-of-11 from the field and Metta World Peace (formerly Ron Artest) had three more personal fouls than he had points (zero) shortly into the second half. Kobe appeared jealous of Lin by the mid-third quarter and awoke his Black Mamba alter ego as he began splashing ridiculous fade away jumpers over the backboard while double teamed and even awed the New York crowd with a laser pass to himself off the glass before tip passing to Pau Gasol for his only assist of the game. Kobe’s gunning brought the Lakers within 6 on a couple of occasions, but the basketball Linja could not be stopped. It sure looked like Lin and his teammates were genuinely having fun out there. Jumping and shouting and laughing with joy while playing the game. And while Kobe had laughed Lin off as a nobody the previous night when asked about him, it was Lin who had the last laugh metaphorically on Friday. He put the nail in the coffin when he called for a clear out with two minutes left in the game, causing the fans to rise to their feet in anticipation. He drove past Matt Barnes and split the Lakers’ seven footers once again finishing off a circus shot and the chants of “Je-Re-My!” morphed into “M-V-P!” Spike Lee and Justin Tuck of the Super Bowl Champion Giants (it pains me to write that) were bowing to him from their courtside seats, which I’m sure if Lin even noticed among the celebratory chaos, would have made him uncomfortable given his strong Christian faith and humble personality. After the game he praised his teammates with a few sports clichés, but was never self-congratulatory and thanked God for allowing him to live his dream. Certainly his performance was worthy of accolades as after Friday night’s game, Lin had scored more points in his first three NBA starts than any player in the modern history of the league. To borrow a line from Ron Burgundy, I wasn’t mad, I was impressed. As we walked out of Madison Square Garden amidst drunken New York fans, the young man I took to the game came away with a similar impression of Lin, noting “I have to respect him.” People who have attended events at the Garden for years and covered professional sports in New York noted it was “one of the coolest nights” in the history of a landmark arena that has seen so many unforgettable events and “one for the ages”. I would have to agree. Neither I nor the young man will ever forget Friday night. The night Jeremy Lin cemented his status as a star and provided hope that all things are indeed possible, even for the overlooked and underrated. Sometimes all you need is an opportunity and to know that someone believes in you. Despite our team’s loss, I hope my client and I can both hold onto this lesson we witnessed firsthand. It seems things don’t always go as planned. Sometimes they turn out better.